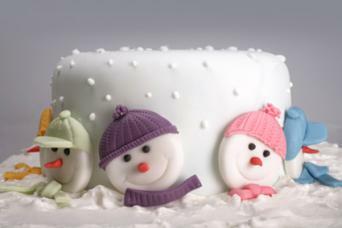 Get your creative juices flowing and whip up Frosty the Snowman cakes for your next holiday party. Children and adults alike are warmed by the sight of loveable Frosty the Snowman. The song was written in the 1950s and was soon followed by Frosty television specials, starting in the 1960s. Still popular today, these programs add a nostalgic feel to the holidays for adults and excitement for children as they see Frosty for the first time. Bringing a Frosty cake to a function is universally appealing. Snowmen are religiously neutral holiday and winter figures. You will not run the risk of potentially offending someone who does not practice Christmas traditions or those who are put off by the connotations of making Christmas about Santa or presents. Making a Frosty cake can be as easy or challenging as your skill level dictates. If you are a novice baker, using a boxed mix with canned frosting can make the process easier. Decorating beginners may find it easier to use a shaped cake pan that has an outline showing where to frost the eyes, nose, and more. Using a boxed cake mix, create a Frosty cake. Bake the layers in two different-sized cake pans, like 9- and 7-inch round. Frost with a canned frosting, and then place the smaller cake next to the larger cake. Cover the cakes in coconut flakes, lightly patting the flakes into the frosting so they stick. Shake the cake gently to get loose flakes off. Use upside down Hershey's kisses as the eyes, chocolate chips as the buttons, a real baby carrot for the nose (place right before serving so the carrot does not change the taste of the cake or go bad), and blue fruit snacks as the scarf. 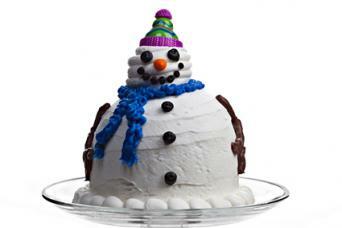 For more ideas on decorating a snowman coconut cake, visit Betty Crocker's website. You could also substitute the boxed cake mix with a coconut flavored cake using this recipe from LoveToKnow Recipes. Use a shaped cake pan to get into detail with Frosty's appearance. Specific form-shaped pans have raised areas indicating where to place various accessories and facial details on the cake. Shaped cakes are often decorated using decorator's tips attached to a pastry bag. Buttercream frosting is a good icing choice, as it is easy to work with and creates nice star shapes. You may also choose to make a variation on a Frosty the Snowman cake by making miniature cakes dusted with powdered sugar (or decorated individually if you have time) or do a simple snowman face. Of course, you can turn any sheet or round cake into a frosty cake by piping a snowman figure onto it or using fondant or gum paste to make snowman embellishments for your cake. You can cut out super easy flat designs by rolling your fondant flat and using a snowman cookie cutter. Alternate with snowflakes and sprinkle them with shiny white decorating sugar. Or, use your modelling skills to turn gum paste into little snowmen to prance across your cake. You can also use decorator icing and marshmallows to form plump and happy snow people. Skilled bakers and decorators may want to attempt making a 3D version of Frosty. Not only will this be a yummy treat, but makes an impressive Christmas table centerpiece. You could also whip up a 3D cake as a present for someone on your Christmas list. For the person who has everything, a homemade gift may be the perfect choice. One way to make a 3D cake is to buy a snowman cake pan that comes with instructions. Although it may be more expensive, the results are worth it. Simply press the two baked sides together using icing as the binding agent. Another way to make a 3D Frosty cake is to make round layer cakes. Use three sizes of cake pans to create the base, face, and top hat. Frost the top layer in black or chocolate to help it resemble a top hat and decorate accordingly. Try a Frosty Cake This Year! 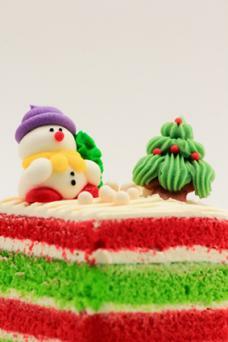 Follow up your Christmas dinner with a delicious Frosty the Snowman cake. Whether you make it yourself or order one, the whimsical character will please everyone's palate.